Finland: Ministry of Interior Päivi Nerg downplays Muslim settler migration catastrophe, ”we could have done better”……. – The Tundra Tabloids……. Finland: Ministry of Interior Päivi Nerg downplays Muslim settler migration catastrophe, ”we could have done better”……. In a normal age and country, politicians and bureaucrats like her would be brought up on charges and jailed. NOTE: All of this hand wringing after all the damage that has been done, in terms of women/children being raped and abused, hundreds of millions of euros wasted and still have illegals refusing to leave, is a bit too much to take. 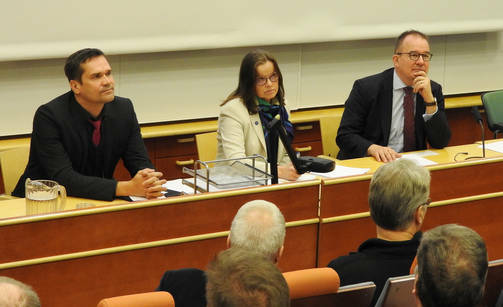 Permanent Secretary of the Ministry of the Interior, Päivi Nerg, felt that the refugee crisis was best managed in Europe, but it was unsuccessful in communications. – If we had jointly communicated better with the municipalities to deal with issues related to the establishment of reception centers and to describe to the public what in Europe is happening on wider scale. Perhaps a little bit of the fear could have been alleviated, could always do better in that, Nerg comments on YLE’s morning tv on Monday. According to her, better communication could have prevented extremist phenomena caused by large numbers of refugees. – Even better to be prepared to face such a situation. What can Finland do more in the countries of origin? Nerg tells Yle that almost 13,000 refugees from 2015 have been granted asylum and residence permits. – They need to be more involved in society. Those who have not been granted permission must find a secure homecoming. The Supreme Court has ruled that forced return of minors must be handled in cooperation with carers and authorities. More than one in three have received asylum. According to the Ministry of the Interior, almost 33,000 refugees came to Finland in 2015. Nerg moves from the beginning of the year to the Ministry of Finance to respond to the national implementation of military reform. Previous Post Previous Post Tarek Fatah: ‘Islamophobia’ is an inappropriate word, says Linguistics professor……. Next Post Next Post Robert Spencer: Saudi crown prince says biggest danger of terror/extremism is to Islam’s rep, no mention of death toll…….